United Nations, Feb 14 (IANS) There may be a golden lining for India in the dark clouds of the tariff war waged by US President Donald Trump against China, and it is likely to increase its exports by as much as $11 billion if the proposed tariffs go into effect next month, according to the UN's trade arm. 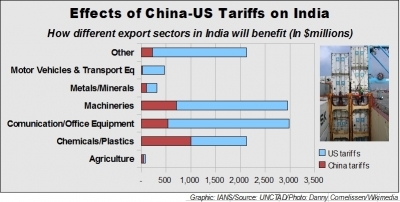 Statistics for India obtained by IANS from the UN Conference on Trade and Development (UNCTAD) show that the nation will benefit the most as a result of the tariffs proposed by the US on Chinese imports, increasing exports by $8.3 billion. It will gain $2.65 billion from China's tariffs on US imports. Explaining the effect of the tariff war on other countries, Pamela Coke-Hamilton, the head of UNCTAD's international trade division said recently: "The US-China bilateral trade will decline and be replaced by trade originating in other countries." "Our analysis shows that while bilateral tariffs are not very effective in protecting domestic firms, they are valid instruments to limit trade from the targeted country," she had said while launching a study, Key Statistics and Trends in Trade Policy 2018, earlier this month. As Trump announced a series of tariffs on imports totalling $250 billion from China last year, Beijing retaliated with tariffs on imports worth $110 billion from the US. The two countries agreed in December to keep them in abeyance till March 1, while they try to negotiate a compromise that would bring down the US trade deficits. The trade negotiations are underway and could reduce the amount of tariffs and change the increases in exports projected for India and other countries. The breakdowns for India - that is not in the published study, which is an overview - was provided by UNCTAD to IANS and they showed that chemicals and plastics will be the top sector benefiting from Chinese tariffs on the US, gaining about $1 billion, while on the US side it will be communications and office equipment with a gain for India of $2.44 billion. India's exports of machinery is expected to go up by $2.4 billion because of US tariffs, and only $714 million because of China's tariffs. Motor vehicles and transport equipment may benefit $442 billion from US tariffs and only $22 million from China's. In various other areas, India's exports are likely to go up by $1.9 billion from US tariffs and $222 million because of China's. According to the World Bank, India's exports to the US in 2017 were $46 billion, and to China the figure was $12.5 billion. The study projected that European Union's exports will increase the most, capturing about $70 billion of the US-China bilateral trade, while Japan, Mexico and Canada will each benefit by more than $20 billion. However, it warned that "while some countries will see a surge in their exports, negative global effects are likely to dominate" because of the "unavoidable impact that trade disputes will have on the still fragile global economy". It said that economic downturn will have have an important effect on developing countries. Despite the assertions by Trump that the tariffs will reinvigourate domestic US manufacturing, the study estimated that of the $250 billion in Chinese exports to be hit by US tariffs, only about 6 per cent will be captured by US firms, while about 82 per cent will go to businesses in other countries. Similarly, of the $110 billion US exports to be covered by China's tariffs, only about 5 per cent will be captured by Chinese businesses and about 85 per cent will go to firms in other countries, the study said.